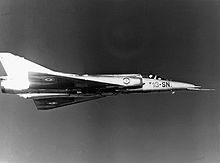 The Dassault Mirage 5 is a supersonic attack aircraft designed in France by Dassault Aviation during the 1960s, and manufactured both in France and a number of other countries. It was derived from Dassault's popular Mirage III fighter, and spawned several variants of its own. The Mirage 5 grew out of a request to Dassault from the Israeli Air Force. Since the weather over the Middle East is clear and sunny most of the time, the Israelis suggested removing avionics, normally located behind the cockpit, from the standard Mirage IIIE to reduce cost and maintenance, and replacing them with more fuel storage for attack missions. In September 1966, the Israelis placed an order for 50 units of the new aircraft. Picture - French Air Force Mirage-5F. The first Mirage 5 flew on 19 May 1967. It looked much like the Mirage III, except it had a long slender nose that extended the aircraft's length by about half a metre, and made it arguably the most elegant of the Mirage delta series. A pitot tube was distinctively moved from the tip of the nose to below the nose in the majority of Mirage 5 variants. The Mirage 5 retained the IIIE's twin DEFA guns, but added two additional pylons, for a total of seven. Maximum warload was 4,000 kg (8,800 lb). Provision for the SEPR rocket engine was deleted. Rising tensions in the Middle East led French President Charles de Gaulle to embargo the Israeli Mirage 5s on 3 June 1967. The Mirages continued to roll off the production line, even though they were embargoed, and by 1968 the batch was complete and the Israelis had provided final payments. The Israelis finally gave up trying to get the aircraft and accepted a refund. Later however, cooperation with France resumed outside the public's eye and Israel received 50 Mirage 5s in crates from AdA, while Ada took over the 50 aircraft originally intended for Israel, as Mirage 5Fs. The aircraft were delivered between May 1971 and February 1974 and put together by Israeli technicians. Officially, Israel claimed to have built the aircraft after obtaining complete blueprints, naming them Nesher. Like the Mirage IIIE, the Mirage 5 was popular with export customers, with different export variants fitted with a wide range of different avionics. While the Mirage 5 had been originally oriented to the clear-weather attack role, with some avionic fits it was refocused to the air-combat mission. As electronic systems became more compact and powerful, it was possible to provide the Mirage 5 with increased capability, even though the rear avionics bay had been deleted, therefore in some subversions Dassault finish with a reinvented Mirage IIIE. Reconnaissance and two-seat versions of the Mirage 5 were sold, with the designation Mirage 5R, and Mirage 5D respectively. However, a little consideration of the differences between a Mirage III and a Mirage 5 quickly shows that these designations were simply for marketing purposes. There was no clear dividing line between the configuration of a Mirage III reconnaissance or trainer version and that of a Mirage 5 equivalent, and in fact they were one and the same in many cases. Picture - A Mirage 5 of the Belgian Air Component parked at an airbase on 15 May 1978 during exercise Tactical Air Meet '78. 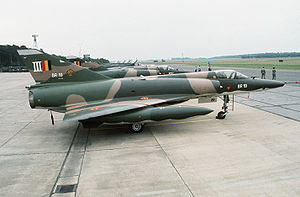 The Mirage 5 was sold to Abu Dhabi, Belgium, Colombia, Egypt, Gabon, Libya, Pakistan, Peru, Venezuela, and Zaire, with the usual list of subvariant designations and variations in kit. The Belgian aircraft were fitted with mostly US avionics, and Egyptian aircraft fitted with the MS2 attack avionics system from the Dassault-Dornier Alpha Jet. In 1978 and 1980 Israel sold a total of 35 of their Neshers plus 4 Nesher trainer aircraft (Nesher Ts) to Argentina where they were locally known first as Daggers and after their last upgrade as Fingers. The Argentines lost two IIIEA and 11 Daggers during the Falklands War in 1982, and as a measure of solidarity the Peruvians transferred ten of their Mirage 5s to Argentina, under the name Mirage Mara to help make good their losses. Chile incorporated some Mirage 5s under name Mirage Elkan. A total of 582 Mirage 5s were built, including 51 Israeli Neshers. The Atar 09K-50 engine, however, was still a good idea, and fit of this engine led to the next Mirage variant, the Mirage 50, during the 1970s. The uprated engine gave the Mirage 50 better take-off and climb characteristics than its predecessors. While the Mirage 50 also incorporated new avionics, such as a Cyrano IV radar system, it did not prove popular in export sales, as the first-generation Mirage series was becoming obsolescent. Chile ordered a quantity of Mirage 50s, receiving both new production as well as updated Armee de l'Air Mirage 5s. The Chilean aircraft were later modernized along the lines of the IAI Kfir as the ENAER Pantera. The Pantera incorporates fixed canards and other aerodynamic improvements, as well as advanced avionics. These aircraft have an extended nose to accommodate some of the new systems. In 1990, Dassault upgraded a batch of Venezuelan Mirage IIIEs and 5s to the Mirage 50 spec, with the upgrades designated Mirage 50M. Picture - A Mirage 5 ROSE fighter taxiing during flight operations at a Pakistan Air Force airbase. The FLIR sensor housing under the cockpit can be clearly seen. Parked in the background is a JF-17 fighter. Project ROSE (Retrofit Of Strike Element) was an upgrade programme launched by the Pakistan Air Force to upgrade old Dassault Mirage III and Mirage 5 aircraft with modern avionics. In the first phases of the project, 33 ex-Australian Mirage III fighters were upgraded and designated ROSE I. The PAF then procured surplus Mirage 5F fighters in the late 1990s from the French Air Force in two batches. 20 fighters from the first batch were upgraded with new cockpits, navigation/attack suites, defensive aids systems and a forward-looking infra-red (FLIR) sensor under the aircraft's nose/cockpit, being designated ROSE II. The cockpits included new MFDs, HUDs, HOTAS controls, radar altimeters and RWRs. 14 Mirage 5F fighters from the second batch were upgraded similarly but with newer systems and designated ROSE III. The FLIR sensors allow the Mirage 5 ROSE fighters to specialise in the night-time attack role. Mirage 5AD : Export version of Mirage 5 for Abu Dhabi, UAE. 12 built. Mirage 5EAD : Single-seat radar-equipped fighter-bomber version for Abu Dhabi, UAE. 14 built. Mirage 5BA : Single-seat version of the Mirage 5 for Belgium, fitted with mainly US avionics. 63 built, 62 under license by SABCA. Mirage 5COA : Export version of the Mirage 5 for Colombia. 14 built. Remaining aircraft upgraged by IAI with canards and new avionics. Mirage 5D : Export single-seat ground attack aircraft of the Mirage 5 for Libya. 53 built. Mirage 5DE : Single-seat radar-equipped fighter-bomber version for Libya. Mirage 5F : Single-seat ground-attack fighter aircraft for the French Air Force. 50 ex-Israeli Mirage 5Js. Eight aircraft withdrawn for conversion to Mirage 50C for Chile, with eight new-build 5Fs built as replacements. Mirage 5G : Export version of the Mirage 5 for Gabon. Three built. Mirage 5G-2 : Four upgraded aircraft for Gabon, two of which were upgraded 5G and two undelivered ex-Zaire 5M. Mirage 5J : 50 aircraft were ordered by Israel, but the order was later embargoed by the French government. The were delivered instead to the French Air Force as the Mirage 5F. Mirage 5M : Export version of the Mirage 5 for Zaire. 14 built, of which only 8 delivered to Zaire owing to funding shortages. Mirage 5MA Elkan : Upgraded Mirage 5BA aircraft sold to Chile. Mirage 5P : Export version of the Mirage 5 for Peru. 22 built. Mirage 5P Mara : Upgraded Mirage 5P aircraft for Argentina. Mirage 5P3 : Upgraded aircraft for Peru. 10 built. Mirage 5P4 : Upgraded aircraft for Peru. 2 built new plus upgraded older aircraft. Mirage 5PA : Single seat radarless version of the Mirage 5 for Pakistan. 28 built. Mirage 5PA2 : New build radar equipped aircraft for Pakistan, fitted with Cyrano IV radar. 28 built. Mirage 5PA3 : New build radar-equipped anti-shipping aircraft for Pakistan, fitted with an Agave radar for compatibility with Exocet anti-ship missile. Mirage 5SDE : Single-seat radar-equipped fighter-bomber version for Egypt, equivalent to Mirage IIIE. 54 built. Mirage 5E2 : Upgraded radarless attack version for Egypt. 16 built. Mirage 5V : Single seat ground attack aircraft 5 for Venezuela. 6 built. Survivors rebuilt to Mirage 50EV standard. Mirage 5BR : Reconnaissance version of 5BA for Belgium. 27 built, 23 in Belgium. Mirage 5COR : Export version of the Mirage 5R for Colombia. Two built. Mirage 5DR : Export version of the Mirage 5R for Libya. 10 built. Mirage 5RAD : Export version of the Mirage 5R for Abu Dhabi, UAE. Three built. Mirage 5SDR : Export version of the Mirage 5R for Egypt. Six built. Mirage 5BD : Two-seat trainer version of 5BA for Belgium. 16, 15 built locally. Mirage 5COD : Two seat trainer for Colombia. Two built. Ugraded with canards and new avionics. Mirage 5DAD : Two-seat trainer for Abu Dhabi, UAE. Three built. Mirage 5DD : Two seat trainer for Libya. 15 built. Mirage 5DG : Two-seat trainer for Gabon. Four built, two delivered 1978 and two in 1984. Mirage 5DM : Two seat trainer for Zaire. Three built, all of which were delivered. Mirage 5DP : Two seat trainer for Peru. Four delivered. Mirage 5DP3 : Updated trainer for Peru. Two new build plus upgrade of remaining 5DPs. Mirage 5DPA2 : Two seat trainer version of 5 for Pakistan. Two built. Mirage 5MD Elkan : Upgraded Mirage 5BD aircraft sold to Chile. Mirage 5SDD : Two seat trainer for Egypt. Six built. Mirage 50C : New build radar equipped Mirage 50 for Chile. Six built. Mirage 50FC : Eight re-engined Mirage 5F aircraft sold to Chile. Mirage 50DC : Two-seat training version for Chile. Three built, two with lower powered Atar 9C-3 engine. Mirage 50CN Pantera : Mirage 50C and 50FC aircraft upgraded by ENAER with help from the Israeli company IAI for Chile with canards, revised, Kfir style nose and new avionics. 13 50C and FC upgraded plus two 50DC trainers. Mirage 50EV : Upgraded Mirage 5V aircraft for Venezuela, with Atar 9K-50 engine, canards and updated avionics (including radar). Six new-build aircraft, three upgraded ex-Zaire 5M, plus six upgraded remaining IIIEV and 5Vs. Mirage 50DV : Upgraded Mirage IIIDV/5DV aircraft for Venezuela, similar standard to 50EV. One new build plus two upgrades. Donald, David and Jon Lake, eds. Encyclopedia of World Military Aircraft. London: Aerospace Publishing, 1996. ISBN 1 874023 95 6. Jackson, Paul. Modern Combat Aircraft 23: Mirage. Shepperton, UK:Ian Allen, 1985. ISBN 0 7110 1512 0. Jackson, Paul. "Mirage III/5/50 Variant Briefing: Part 1: Dassault's Delta". World Air Power Journal Volume 14, Autumn/Fall 1993. London:Aerospace Publishing. ISBN 1 874023 32 8. pp. 112-137. Jackson, Paul. "Mirage III/5/50 Variant Briefing: Part 2: Fives, Fifties, Foreigners and Facelifts". World Air Power Journal Volume 15, Winter 1993. London:Aerospace Publishing. ISBN 1 874023 34 4. pp. 100-119. Jackson, Paul. "Mirage III/5/50 Variant Briefing: Part 3: The Operators". World Air Power Journal Volume 16, Spring 1994. London:Aerospace Publishing. ISBN 1 874023 36 0. pp. 90-119. Lake, Jon. "Atlas Cheetah". World Air Power Journal 27: 42-53, Winter 1966. P�rez, San Emeterio Carlos. Mirage: Espejismo de la t�cnica y de la polx�tica. Madrid: Armas 30. Editorial San Martin, 1978. ISBN 8-47140-158-4. Taylor, John W.R. Jane's All The World's Aircraft 1976-77. Jane's Yearbooks, 1976. ISBN 0 354 00538 3. Dassault Mirage 5 Pictures and Dassault Mirage 5 for Sale.